In 1922, outfits 0-6 were significantly revised and a new No.7 outfit was introduced. The outfit manuals were completely overhauled. The previous three books of instructions which had built up over a period of several years, were combined into a single manual with all the models for a particular outfit grouped together and for the first time numbered in a logical manner. For example, outfit No.2 models were numbered from 201 upwards and outfit No.3 from 301 upwards. Because of the significant revision of the outfit contents there was a considerable shuffling of models between outfits. The models for outfits 0-3 were all taken from the the previous manuals. However, they all had new improved pictures. Whereas previously most of the model pictures were black and white line drawings (apart those from the old Book 3), they were now shaded to give photographic realism. Also many of the models had minor design changes to take advantage of new parts. A few had a significant redesign. The models for outfits 4-7 were also all taken from the the previous manuals. However only a small number were redesigned in 1922 and the vast majority were retained unchanged, still with the old line drawings. Models in outfits 4-5 then had picture/design changes in 1923, but outfits 6-7 had to wait until 1924/5. During the era a number of old models were deleted and new models introduced. Click here for more details. 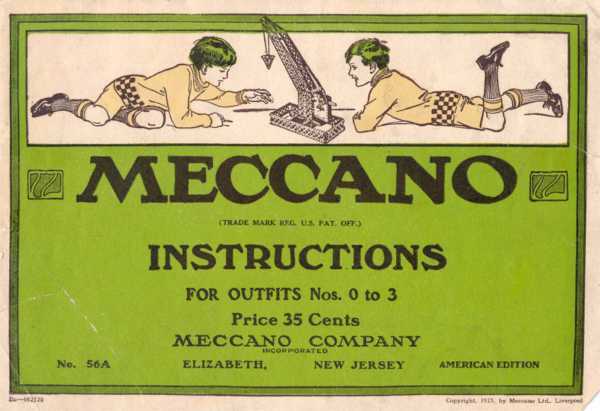 A 00 outfit was introduced in 1923. The models were all existing outfit 0 models. It had its own model leaflet which was a single large folded sheet. The outfit 00 leaflet was significantly revised in 1925. Either the prices of parts, motors and outfits etc. were amended to suit or no prices were given (or even omitted altogether) and a note said that details/prices were available from the local dealer. The following manuals were issued:- 00, 0 (Book 0), 0-3 (Book A), Book 1 (outfits 0-7). Unlike other overseas editions, the American editions had a different cover and an American address on the front. 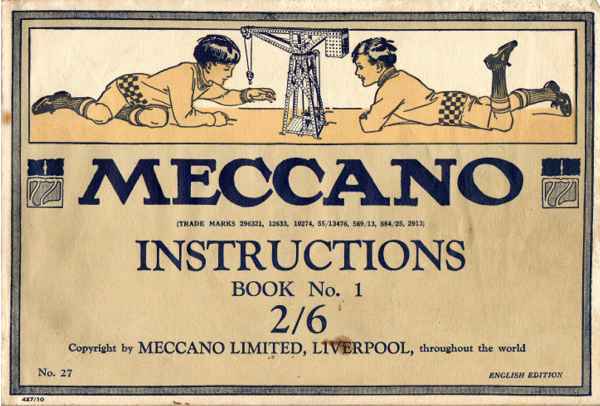 They were printed in the USA and had different print codes to the Liverpool manuals. 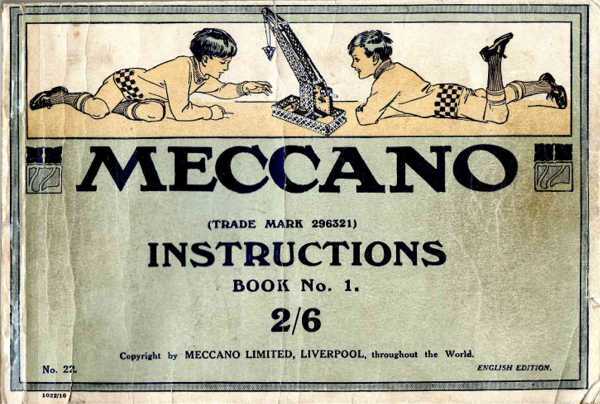 They were based on the 1923 Liverpool manuals and had the same models and numbering, although a few models had their names changed. The models did not change during the era and so did not follow the subsequent changes in the Liverpool issued manuals. The No.7 outfit was not available in the USA. The following American manuals were issued:- 00, 0, 0-3, 4-6. Note that the new 0-3 manual was not issued until 1923 and the 4-6 manual in 1924. See the 1916-21 era for American 1922 0-3 and 1923 4-6 manuals. Like Liverpool, a 00 outfit was introduced in 1923. In 1927 a new larger 00 outfit was launched, which was similar to the outfit 0 in size. This new outfit was actually the first of the next era's outfit, so the manual for this outfit is not considered here. See the 1928-34 era for details.